The Kabbalistic (or Cabalistic, or Qabalistic) Cross exercise is another “staple” of Western Magical Traditions. Because of the brevity and simplicity of the rite, the deep symbolism of the operation is often overlooked. Properly performed it orients the initiate as the center of the universe and as the point of mediation between the active and passive polarities. I do not intend to provide an entire exegesis on the symbolism of the practice, but rather point out that the basic symbolism is identical to the principles of the Christian Eucharist. This is very evident when looking at the geometry formed by the Sefirot activated during the practice. We are allegorically referring to the descent of the wafer (representing the divine body, i.e. the “light” from Keter) into the chalice filled with the divine blood (i.e. man, the “Y”, or tau “T”, of Chesed, Gevurah, and Malkut). It is the union of the divine body and blood within the practitioner and the crucifixion of the practitioner to the spiritual axis mundi. In Christian Gnostic terminology this is nothing less than the initiatic path to Christ. But one receives the unction of the light of the power of the cross. This power the apostles called “the right and the left.” For this person is no longer a Christian but a Christ. Gospel of Philip. In, James M. Robinson, ed., The Nag Hammadi Library, revised edition. (San Francisco, HarperCollins, 1990). i. Stand erect facing east, and silence your body and your mind. ii. Observe in the nothingness the primeval contraction and birth of the light of Keter above your head. It pulses with energy and by its very existence implies the polarity of Malkut below your feet. iii. Bring the light down from Keter and touch the forehead while vibrating ATEH (“thou art”). Feel the light enter you from above. iv. Continue drawing the light downward pausing to bring awareness to the Tiferet and Yesod centers along the way. Vibrate MALKUT (“Kingdom”) as you descend the light toward the Sefirah beneath your feet. vii. Bring your the hands before you crossing them over your chest as you vibrate LE-OLAHM (“for eternity”). 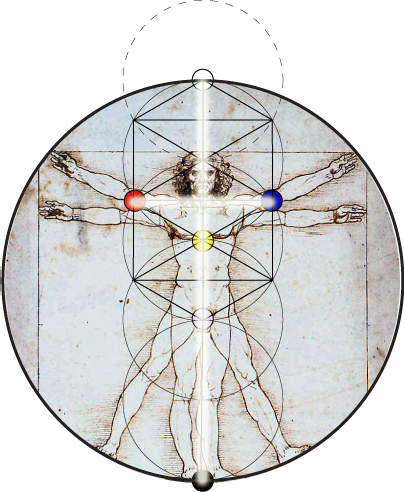 Contemplate the cross of light piercing your center and perfectly balancing the polarities of the right and the left.